Aquarius August 2015 Horoscope predicts that you will not succeed if you follow your independent path this month. You have to adapt to others and their ways if you want to succeed in life. Collaboration with colleagues is necessary and all forms of conflicts at work will have to be eliminated. Majority of the planets are in the Northern half of your birth chart, Aquarius. Career and professional issues will have to be given priority over home and emotional affairs in August 2015. Whatever is good in career such as financial rewards and improvement of status will happen before 21st August 2015. You have to slog after that to achieve the same results. Promotions, salary hikes, new business ventures are on the cards, but will be delayed towards the end of the month. The Aquarius 2015 August monthly predictions foretell that this month is not auspicious as far as finances are concerned. Money will come from family members, and personal earnings will take time to fructify. Use this period to pay off debts and reduce expenditure. The planetary positions for the Aquarians conspire this month to show plenty of love affairs this month. Love will chase you and singles will have no option other than to get into romantic relationships. Committed engagements will get converted into marriages. Love will be more sexually passionate than romantic this month. Married couples can think of planning for a child. 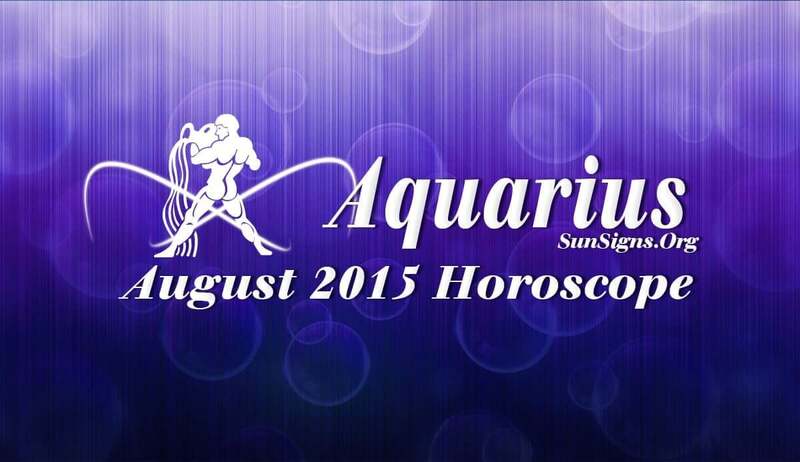 The August 2015 Aquarius astrology forecasts predict normal health till 21st. There will be marked improvement in energy levels during the last week. Enough relaxation is required to stay healthy. You should concentrate on coming out of addictions and improve your personality by cultivating good habits.